Hello, Gorgeous! : life in pictures: baby, it's really cold outside. This week was cold cold COLD! I'm talking painfully so. It snowed pretty much every day and made us re-hibernate because of the slippery road conditions. The downside? I didn't go grocery shopping and we were left scrounging for food all week. The upside? We had lots of canned soups and bread. And who doesn't like grilled cheese sandwiches?! Thankfully, by the end of the weekend the snow had let up and the hubs and I had a nice date night out. The snow is SO pretty! 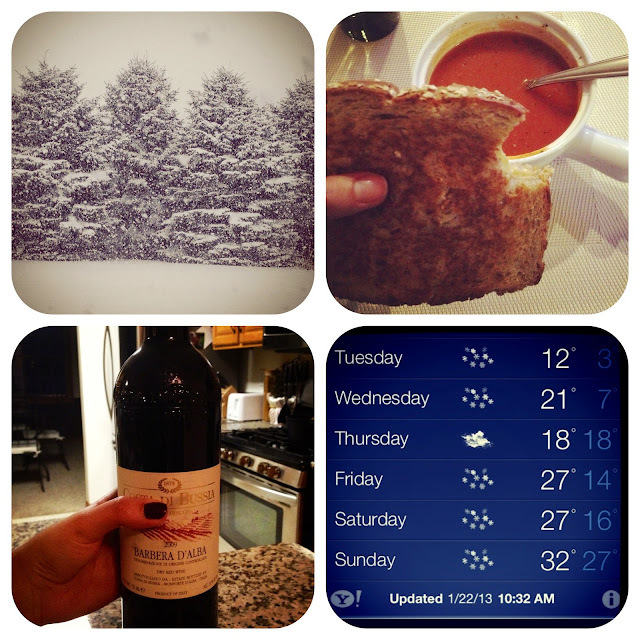 And grilled cheese and tomato soup is the perfect meal to have when you're snowed in! Stay safe and warm yourself, doll! I thought that looked pretty warm on the forecast then I realised it was probably in fahrenheit lol. Our weather is insane in Michigan. Becareful driving tomorrow to work. Freezing rain for this area due to Winter storm Luna. I call it sick people food! It's good food but I tend to want it when I'm sick or really cold since it's comfort food. There's been a lot of that in our house the last few days.